The first step is to download the Mod Launcher. You can do this by heading over to the Tool Downloads page and then clicking the download button. Next, you want to extract the ZIP archive of the Mod Launcher you just downloaded. It is recommended that you do not extract the Mod Launcher to your Hit & Run install directory. To extract the archive using the built in Windows utility, simply Right Click > Extract All... to open the Extract Compressed (Zipped) Folders dialog. From there, choose where you want to extract the Mod Launcher and then click Extract. From there, choose where you want to extract the Mod Launcher and then click OK.
A folder named DLLs: This folder contains DLLs used by the Mod Launcher. Unless explicitly instructed to do so by Donut Team, you should avoid making changes to the contents of this folder. A folder named Hacks: This folder contains all of the hacks used by the Mod Launcher and mods created for it. Unless explicitly instructed to do so by Donut Team, you should avoid making changes to the contents of this folder. A folder named Mods: This is one of several places where you can install mods for the Mod Launcher. There are a few mods included in this folder but you're free to remove them if you'd like. 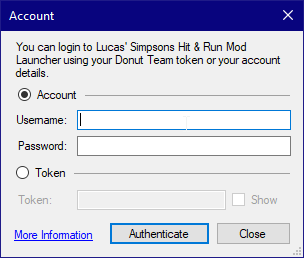 Lucas Simpsons Hit & Run Mod Launcher.exe: This is, of course, the actual launcher itself. Let's go ahead and start up the Mod Launcher. Upon first startup, you will be prompted for whether or not you'd like to allow the Mod Launcher to communicate with the Donut Team website. For more information about this feature, see Donut Team Account Integration. If you choose to opt-in to this feature, you'll need to link your Donut Team account by signing in with your account details or by using your Donut Team Token. The first thing you'll want to do is click Open... in the bottom left corner and select Launcher Settings.... From there, move over to the Game tab. Here you'll want to click the Browse... button next to Game EXE Path and browse for the Simpsons.exe in your install folder for the game. Now that you've told the Mod Launcher where your install of the game is, you can launch the game via the Launch button on the bottom right of the window. If you'd like the Mod Launcher to stay open in the background while you're playing, then untick the Close Launcher checkbox next to the Launch button. Aspect Ratio Support: Enables Automatic Aspect Ratio on the world and the HUD with an FOV of 78. Bug Fixes: All user facing bug fixes are enabled. Frame Limiter: The Target Frame Rate is set to 60 (except for on Loading Screens) and it is strongly recommended that you do not change this as the game's physics behave best at this frame rate. Resizable Window: Presenting, processing and rendering while resizing are enabled. Screenshots: Flash Screen and Play Sound are enabled. The following hacks are always enabled when using the Mod Launcher. Modern Computer Support: Makes the game work properly on Windows Vista or newer. Modern Resolution Support: Makes the game support any resolution your graphics card supports instead of 6 hardcoded resolutions. And you're done. Now you're playing with power.